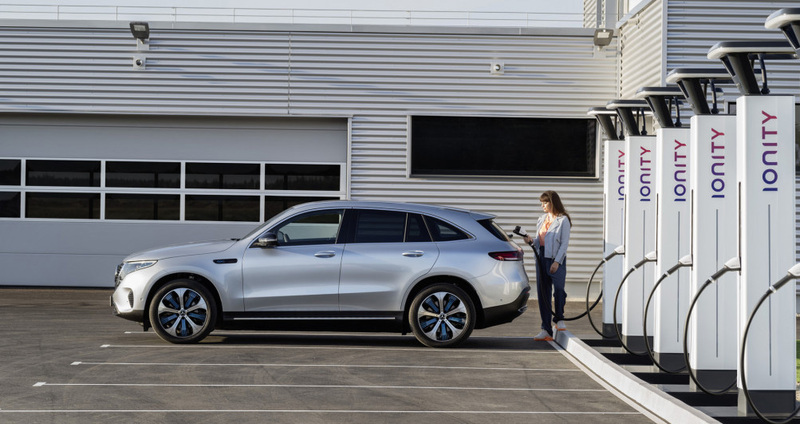 When the Mercedes EQC electric crossover was unveiled last month, Daimler said it would have an 80-kiloWatt-hour battery pack good for approximately 200 miles of range. Now the automaker is saying that the EQC could be capable of 279 miles per charge on the old European test cycle that’s being consigned to the dustbin this month in favor a more realistic New European Drive Cycle test. Given the wildly overstated range estimates that were common under the old test cycle, the 279-miles could translate to something closer to 230- to 240-mile territory on the federal EPA ratings scale used in the U.S. Unclear is what tweaks Mercedes accomplished to improve range or whether the automaker simply understated the range figure when it was initially released at the debut party in Sweden. The 402-horsepower, dual-motor, all-wheel drive Mercedes EQC is about the same size as the company’s GLC. It is slated to launch in Europe in mid-2019 and to arrive in the U.S. in 2020.